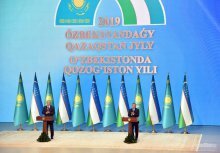 “The Year of Kazakhstan in Uzbekistan testifies to the dynamically developing strategic partnership, the growing confidence, mutual support, the inseparability of the bonds between our two countries. This momentous event is also a symbol of the eternal and sincere friendship, cultural and spiritual community of the two peoples,” Shavkat Mirziyoyev said. “This historic day for the Uzbekistan-Kazakhstan relations will serve as a solid foundation for the further development of friendly relations between our peoples,” the head of our state noted. The resolution of the President of Uzbekistan, signed 13 March 2018, triggered a broad study of the creative legacy of the outstanding Kazakh poet and thinker Abai Kunanbayev. 577th anniversary of the birth of our great ancestor Alisher Navoi was celebrated on a grand scale in Kazakhstan. The President of Kazakhstan Kasym-Zhomart Tokayev expressed gratitude for the attention paid in Uzbekistan to the development of the Kazakh language and culture. He noted that the events of the Year of Kazakhstan will further cement the cultural ties between our fraternal peoples. In our country, extensive preparations have been carried out for this occasion. Events within its framework will open up new horizons for representatives of the arts, science, education, business of our countries to expand mutually beneficial contacts, exchange knowledge and achievements. All this will contribute to the mutual enrichment of cultures and the further harmonization of our peoples.